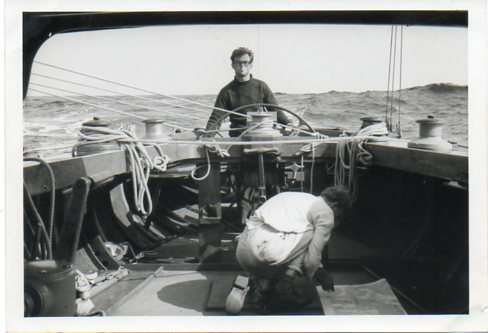 In 1964 I was 20 and had some sailing experience, gained with the wonderful Leander Sea Scout Group of Kingston-on-Thames in their 26ft cutter Sandling and their other boats, and also with the Ocean Youth Club of Cowes on their yawl Duet. 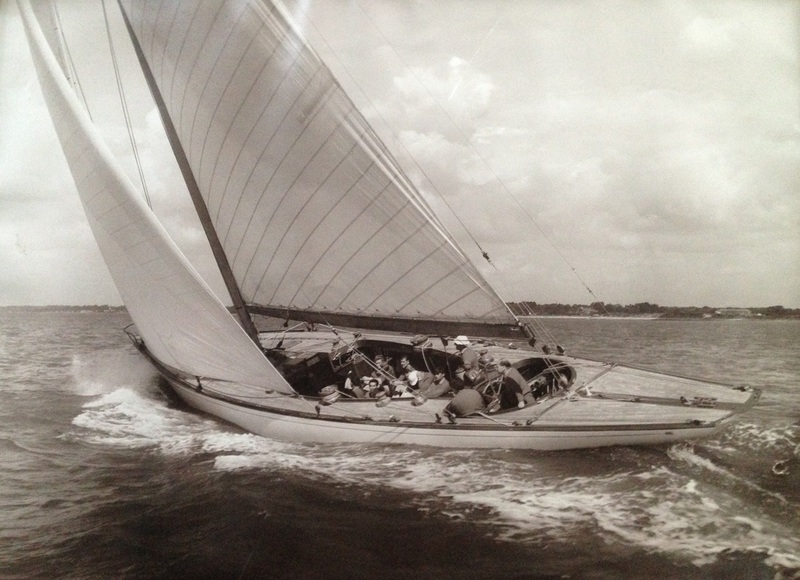 At the time Sceptre was being raced annually at Cowes by her owner Eric Maxwell. 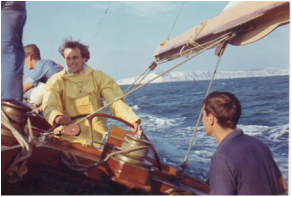 She was taken from, and returned to, her base on the Clyde by professional yacht deliverer Peter Hayward who used various crews of 5 or 6 enthusiasts. 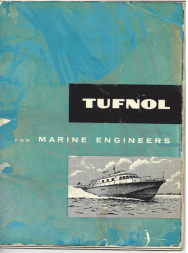 By luck, I was offered a place on the 1964 return trip to the Clyde when my brother Martin was unable to go, owing to exam commitments. 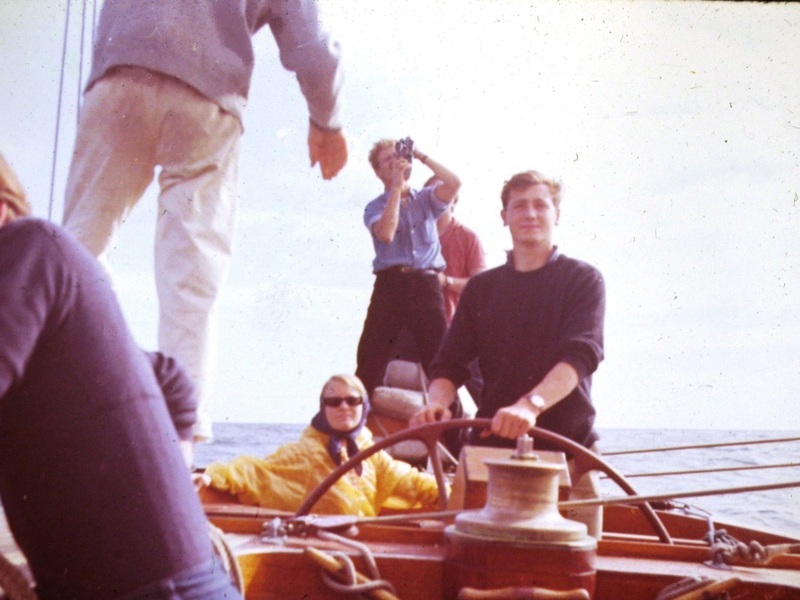 Arriving at the Jolly Sailor Pub on the Hamble, I met Peter and the other crew members and learnt that there was a film of the trip going to be made by an accompanying motor yacht with its own crew, presumably for Eric Maxwell (maybe somebody knows of the existence of this film?). 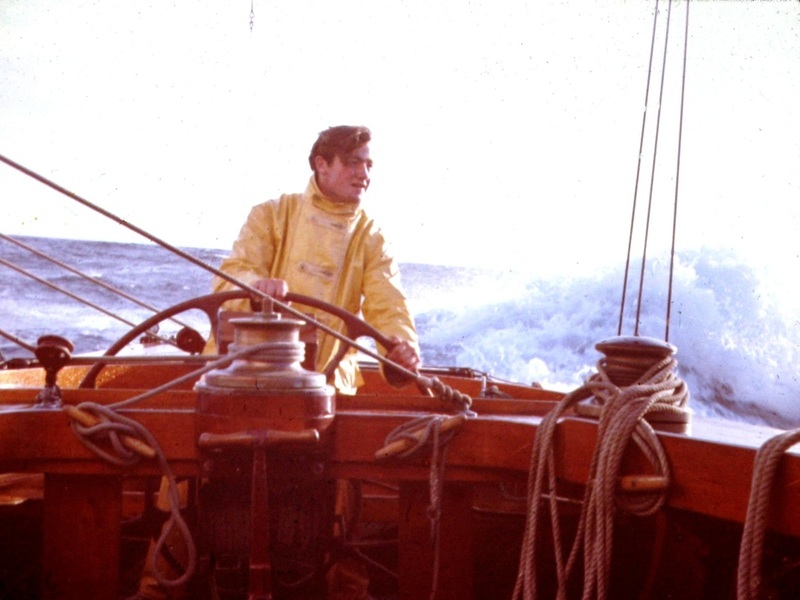 It was fantastic sailing and after a short time I was able to helm both by day and night, although no doubt Peter had an eye open for the yachts progress at all times. 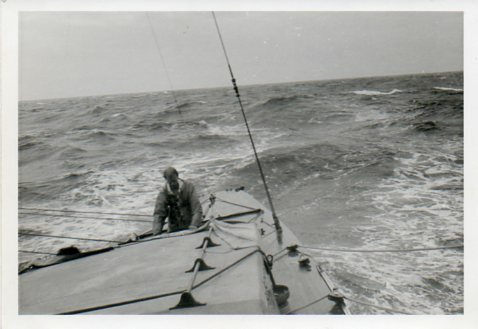 Through the Irish sea we had strong following winds and if I were to pick one abiding memory of the trip (and indeed my entire my sailing life) it would be being on deck alone, helming Sceptre through the Irish sea at night in force 6 – 7 winds , with the beautiful boat planing forward on breakers incandescent with blue phosphorescence, lighting up the sails. 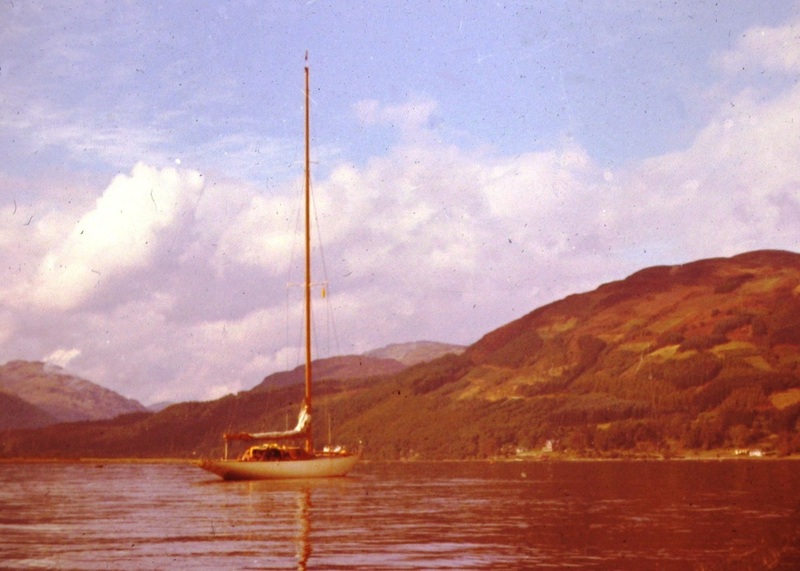 There were many incidents, including a broken jib pole, but we arrived in one piece on a beautiful still, calm Holy Loch. 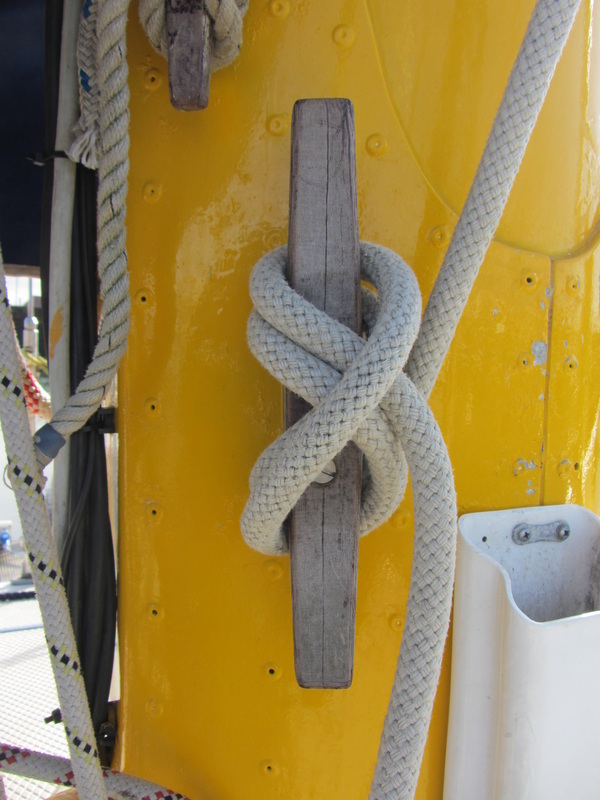 I took several pictures on the trip which I was quite pleased with. 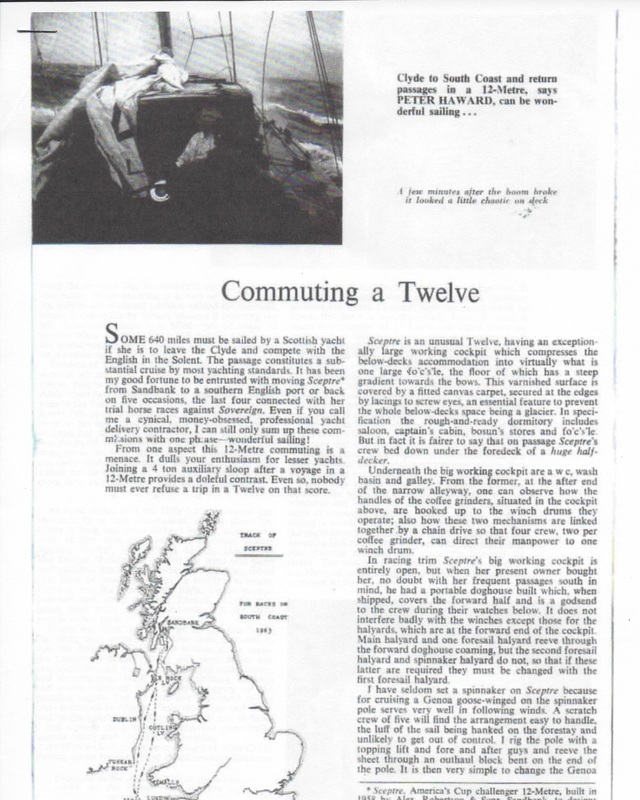 When I shared them with Peter he said that he was writing an article entitled﻿ “Commuting a 12 “﻿ for Yachting Monthly in March 1965 (click, or see below) and would use some of my photographs for the article. 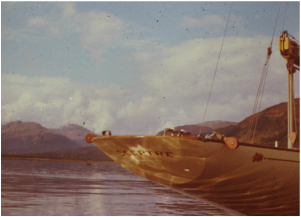 Peter’s article described an earlier delivery voyage for Sceptre with a different crew but I was thrilled with my £5 fee for the photographs and I treasure my copy of the magazine. Peter Haward at the navigation station! 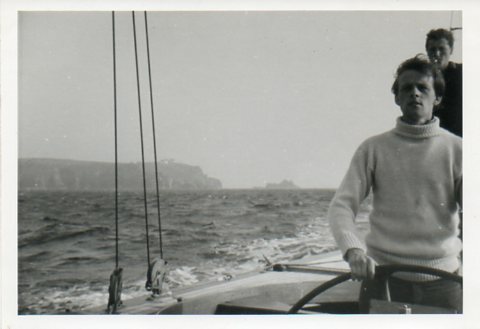 Mr Douglas Boller, now Vice-Commodore of the Kingsmill Yacht Club and living near the River James in Virginia, USA, emailed his memories of learning to sail during the summer holidays in 1959, ending up helping a short-handed Sceptre crew! 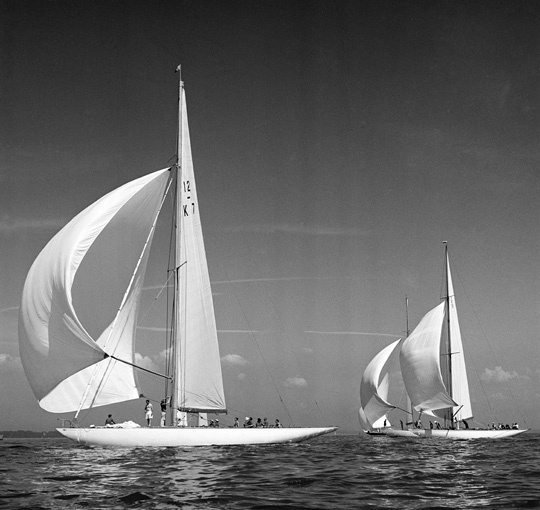 It was Clyde Week in 1959 and Sceptre was the big attraction with crowds lining the seafront. 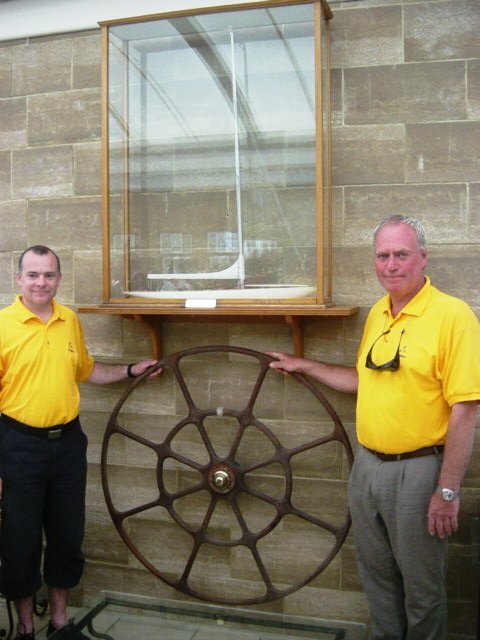 The new owner was Eric Maxwell and David Boyd was on hand for helming. 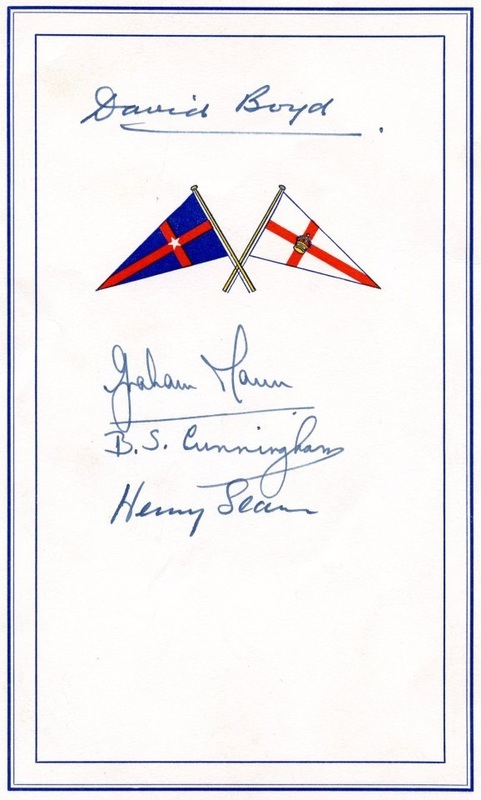 Being students, my friend Jim Gibb and I had signed on for a week with the Scottish Council of Physical Recreation at Hunter's Quay to learn to sail. 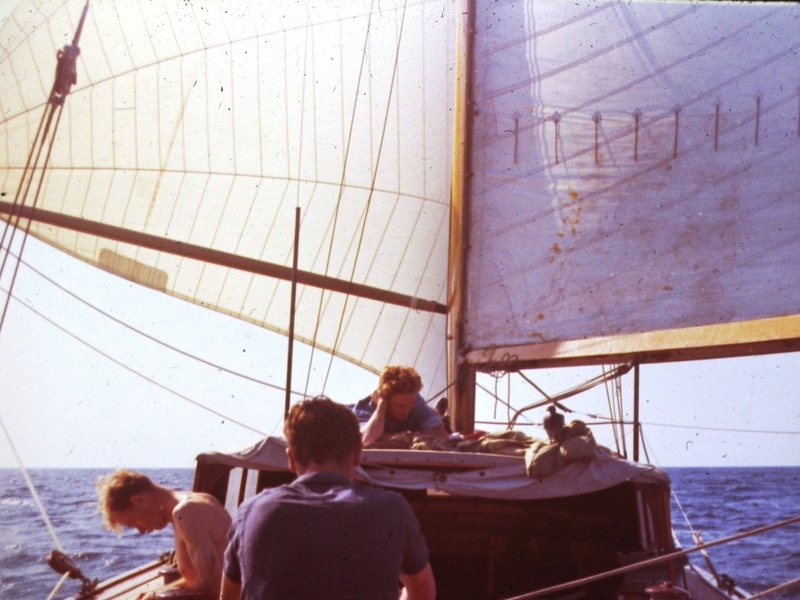 The Pleiades class boats normally loaned to SCPR were being raced by their owners that week so we happily crewed for them rather than learning the ropes on land. 12 metre Flica, and were told that if she was in sight in the thick mist astern, then handicapping was such that Sceptre was losing the race. 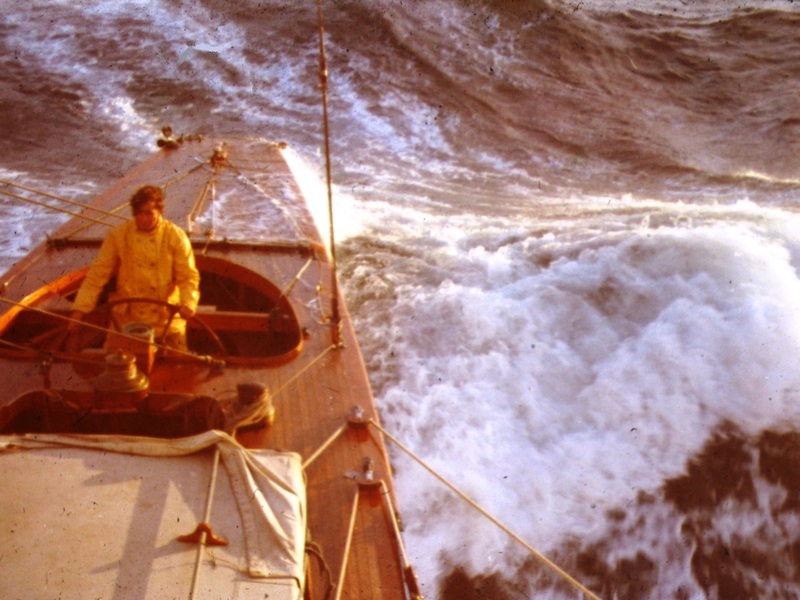 Although not a thrilling sail, being on the America's Cup challenger was a lifetime memorable event for us. 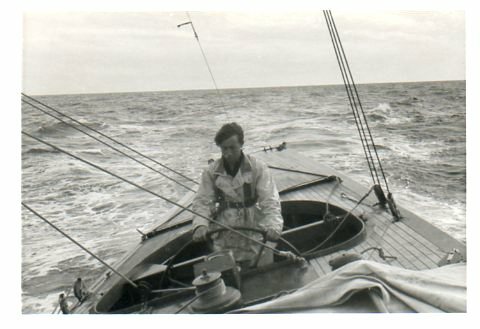 Jim later became Royal Gourock Commodore and a well-known international race judge. I currently find myself Vice-Commodore of the Kingsmill Yacht Club in Virginia. A picture of Sceptre hangs proudly on the dining room wall. Well, where to begin? 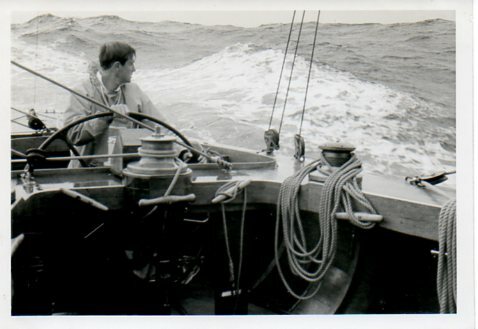 My father Maurice Holland was the craftsman that made the tiller for Sceptre in 56/58. I was around 10 years old and said "Dad is that a steering wheel?" Not a yacht type - but! Dad also made the auto steering gear. 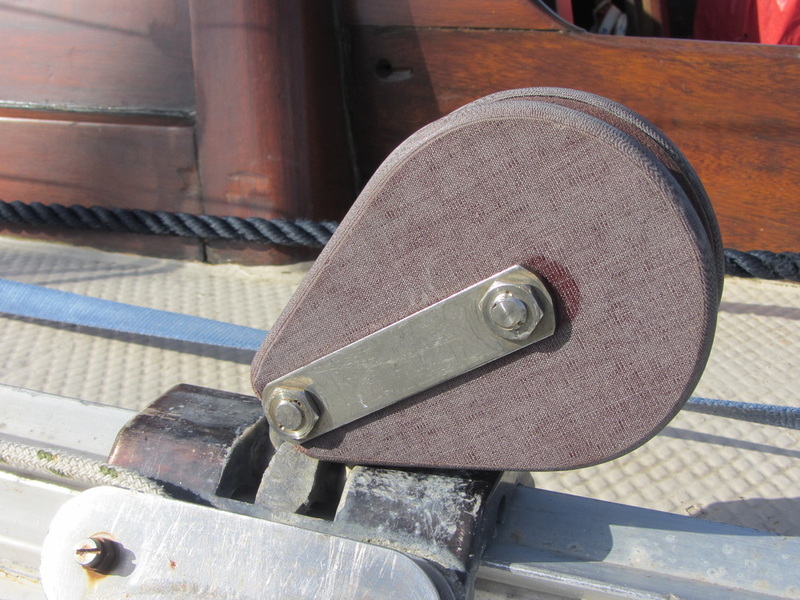 He put (a) scaled down (model of) the same gear on Alana, the model yacht he built for me. (It's) with my son now. 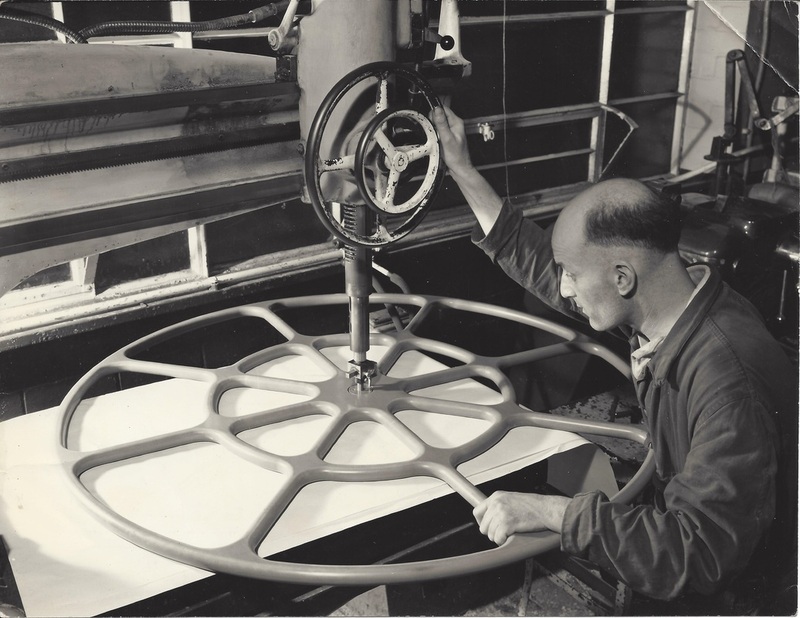 I have the company magazine and the original photograph (of my Dad) at the lathe. I’m not sure whether this is of interest but it would be lovely to give this to you for safe historical keeping. 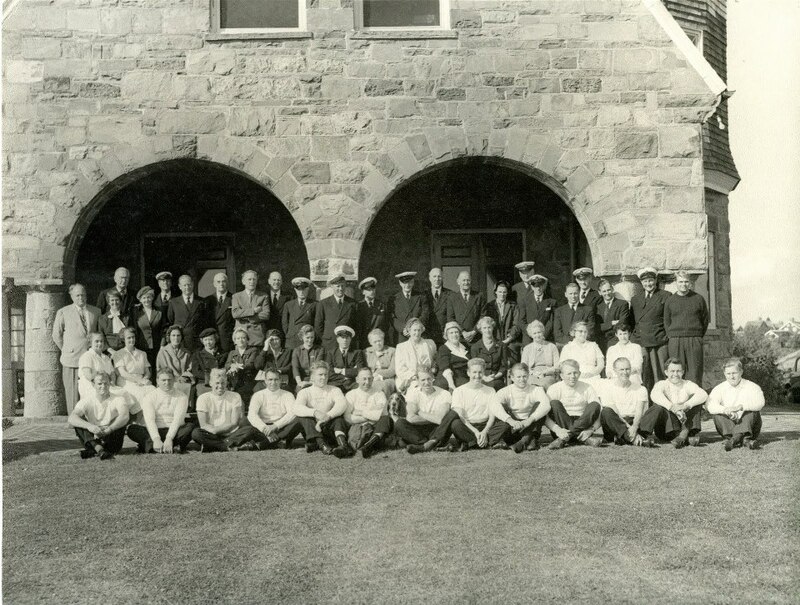 Little known to the sailing community was the presence of an American in the “Sceptre” camp. 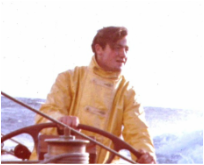 Living with the crew for a month was Thomas (Tom) A Barrett Jr who had just completed his summer employment as a Pleon Yacht Club (Marblehead) sailing instructor. 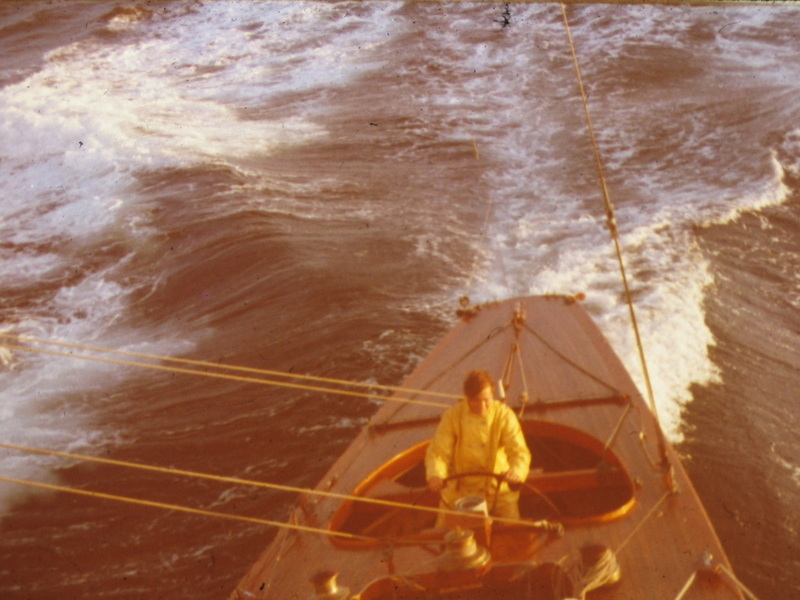 Mr Barrett (then age 20) delivered a launch on loan from George O’Day. 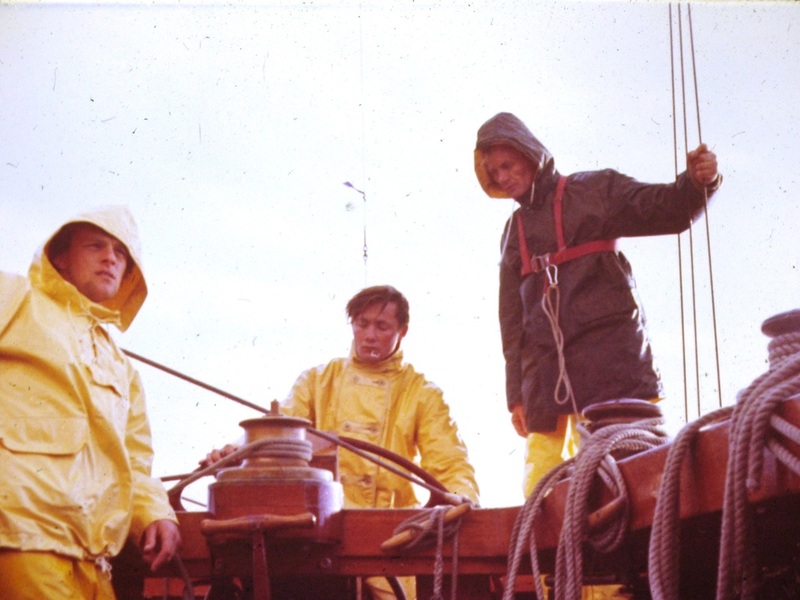 Upon arrival Commander Mann (Sceptre's Skipper) asked Mr Barrett to stay and operate the launch – which he did, spending a month in “Sceptre” crew overalls, living with the crew, helping with boat maintenance, cleaning etc. 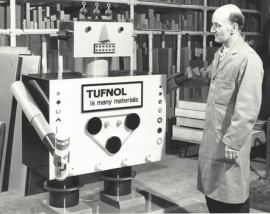 He was an unpaid volunteer. There is a reference to his participation in Hugh Somerville’s book "Sceptre" published in 1958, page 132.